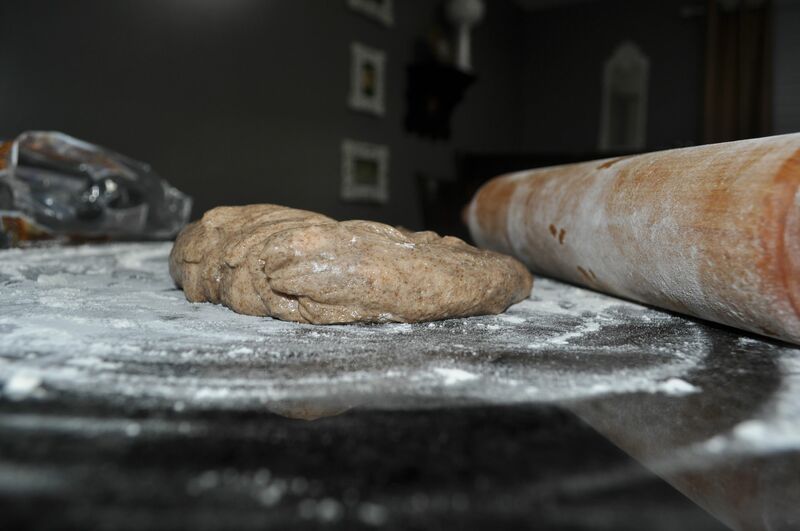 Using a rolling pin makes it feel very homemade, especially if you recycle the sack the dough came in first. 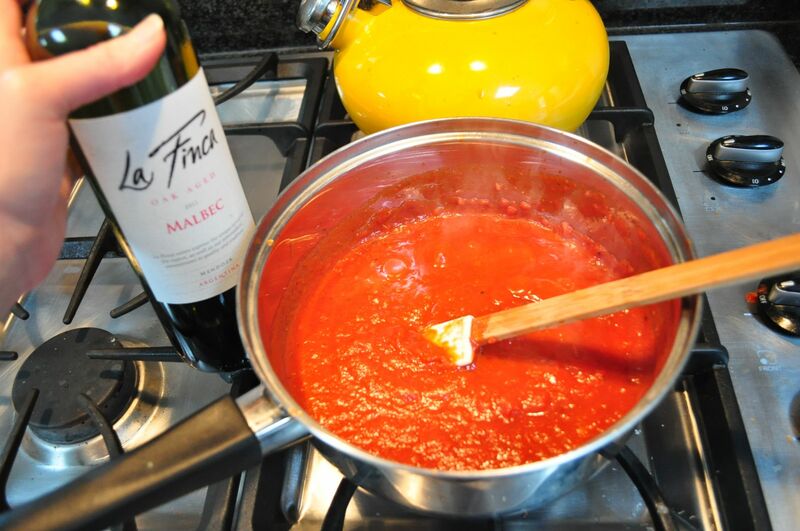 A can of organic, no adds tomato sauce — you can add your own red wine, oregano, garlic, onions, spices. Ready-made marinara usually is chockfull of sugar. And adding wine to tomato sauce is a good thing. OR you can use as a base that pesto sauce you made in the spring and, like a forward-thinking home chef extraordinaire, froze for such a time as this. 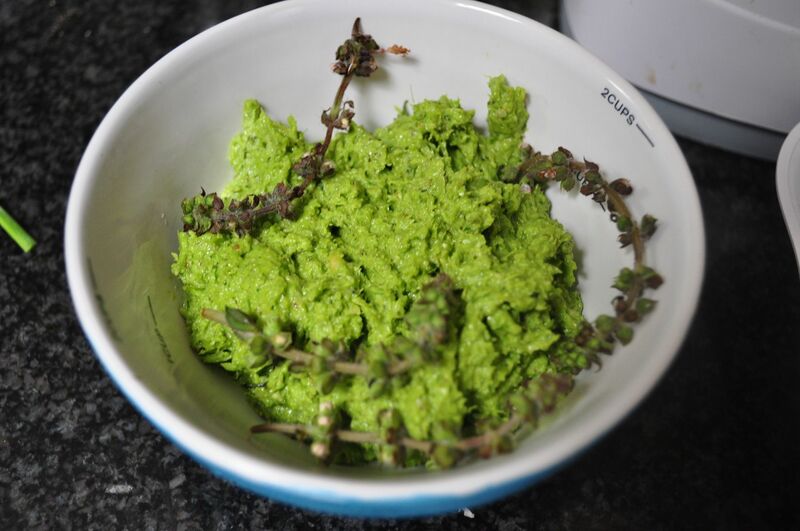 Confession: I wish I had frozen gobs of this pesto, but this is a just a memorial photo from my spring batch of garlic-scape goodness. And then you get creative. My first attempt, I went a bit crazy with the toppings. 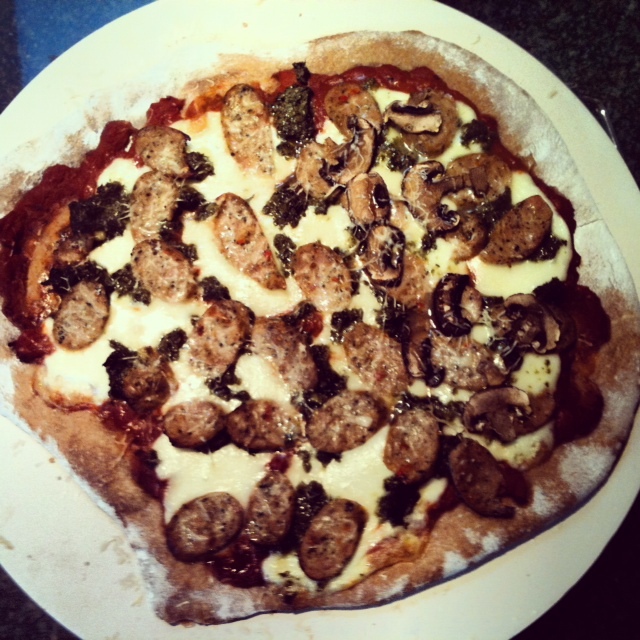 Sausage, mushrooms (on my half) and dollops of pesto. Yes please. 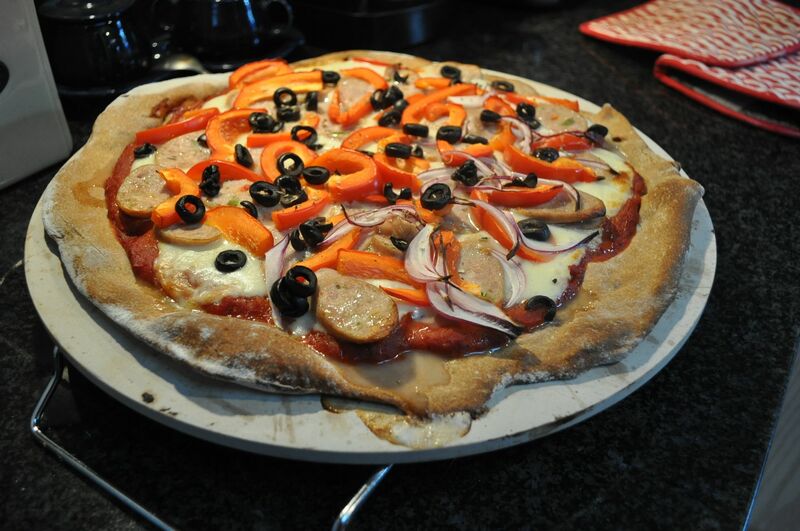 The best part about homemade pizza is it’s a blank slate, so let those weeknight creativity juices flow. When I’m eating out or perusing my food mags, I’m taking mental notes all the time of foods that just might be a match made in heaven. Figs and bacon? Pesto and sun-dried tomatoes? Local tomatoes and basil and balsamic? Sadly, when I mention that we’re having pizza, my husband usually puts in his order before I can give these creative thoughts full wind. 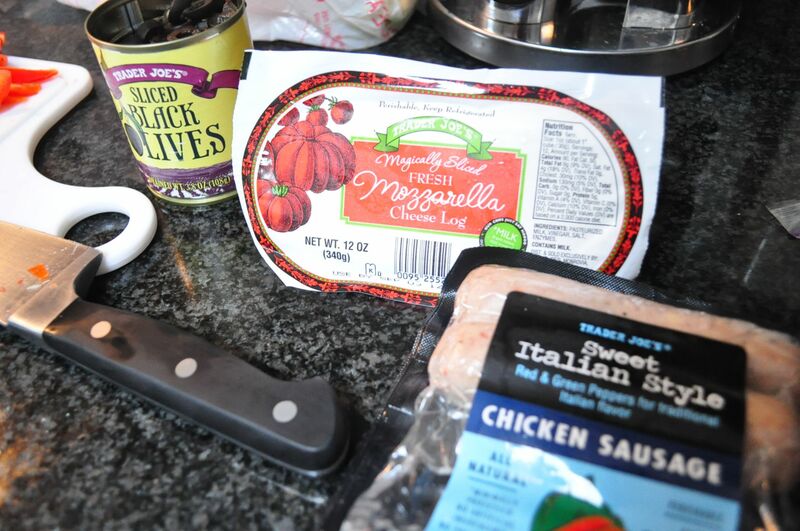 “Sausage and peppers and olives and…” you get the picture. Boring, but delicious, supreme-style pizza is all he ever requests — heavy on the black olives. When we lived in Washington state, we frequented our local Papa Murphy’s, which happened to be owned by a member of our church and staffed by most of the teenagers from our church — so it was like a good deed, supporting them at least once a week. 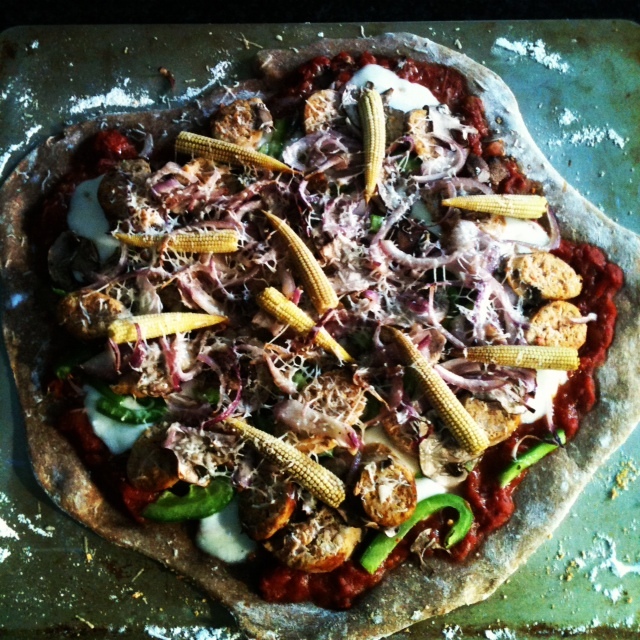 We loved the thin crust Mediterranean pizza with chicken and spinach and sun-dried tomatoes and a garlicky sauce. And seeing all the ingredients plopped on in front of us made the whole experience feel (at least) three steps above stopping by a greasy pizza joint. I mean, we had to turn on the oven and everything! Well, the DC area is sorely lacking in Papa Murphy’s locations (the nearest one is in Chantilly). So we had to supplant our weekly tradition with something. When I ask my husband what he wants to eat for the week, he says the same thing almost every week: “pizza and burgers.” As someone who loves to try new things, this kills me a little bit. 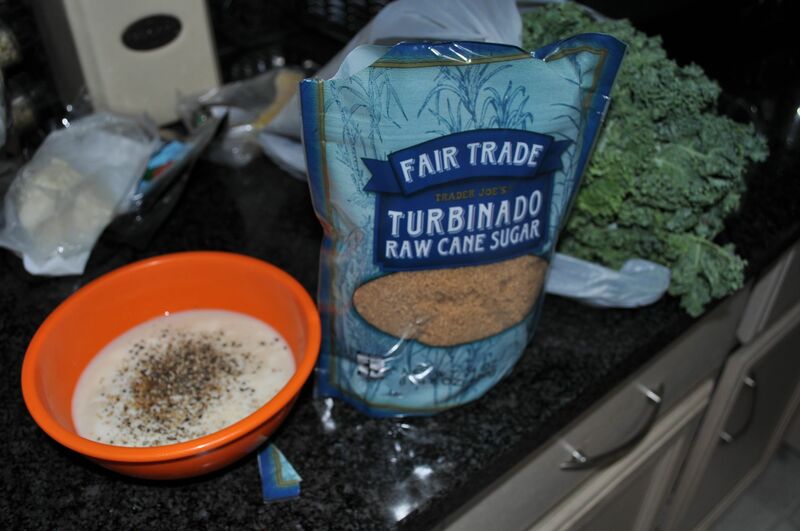 But I acquiesce, because I do love him and those are relatively budget-friendly meals. Thanks to our neighborhood Trader Joe’s, I’ve found a way to make almost weekly renditions of pizza night that I can feel fairly good about (I mean, whole wheat crust! Major brownie points). 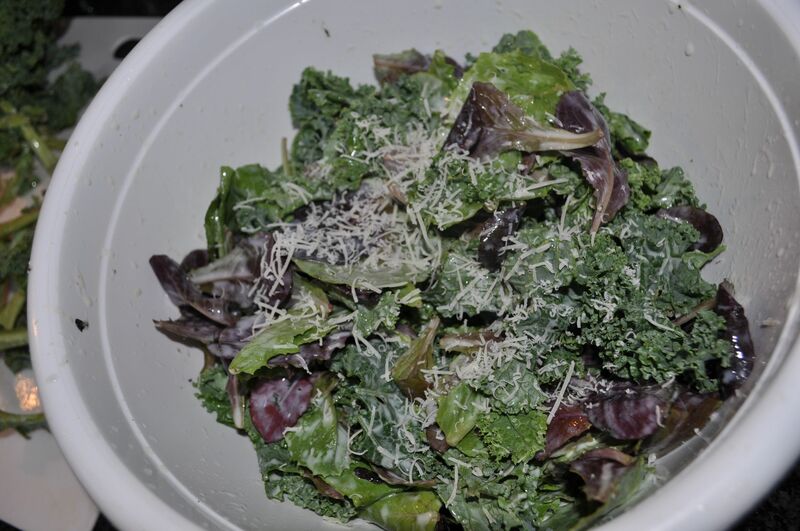 And to make me feel even better about it this past week, I threw in an attempt at raw kale salad. You see, I have this entire carton of buttermilk that I bought to fry okra (before opting for a healthier baked version), and gobs of kale. So I googled kale salad with buttermilk dressing and Voila! Recipe. Of course, I used whatever kale I had, which was an extremely thick and green and curly version, probably not ideal for raw eating. I figured as much and threw in some romaine leaves to even it out. Our dinner guest said he liked it; my husband was a bit more honest. It’s definitely not for the faint of heart, or those who diets don’t mimic that of rabbits. But I did like it — and it was a great use for piles of kale and an extra carton of buttermilk (the rest of which will go into breakfast-for-dinner biscuits later this week). So here’s to giving you permission to be a bit lazy. You don’t have to grind your own flour and roll your own dough and milk your own cows for cheese EVERY time you make pizza. Just once a month or so, you know, so your milking skills don’t get rusty.